Clasping-leaf pondweed can be easily identified by its thin, delicate, oval shaped leaves. The leaves are wide and wavy with a broad base that 'clasps' the stem. The leave's edges are smooth and the tip comes to a point. The leaves are typically between 3 and 12 centimeters in length. 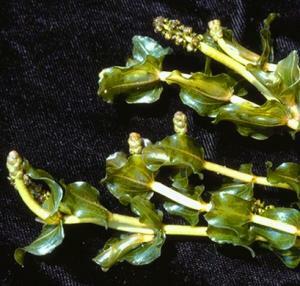 Clasping-leaf pondweed can sometimes be confused with curly-leaf pondweed. The easiest way to tell the two species apart is to look at the tips of the leaves. Clasping-leaf tips will come to a point while curly-leaf tips will be blunt and rounded. The best solution for Clasping-leaf pondweed control is using our Dock and Swim Area Products. The chemicals only need about an hour of contact time with the plants to be effective. the treated area should be clear of plants within two weeks from applying the product.